Common sense tells us that performing a criminal records search on a potential or existing employee is a valuable part of the employment screening process. The minimal time, effort, and expense involved in performing a criminal records search can prevent significant loss, harm, and damage from falling into the lap of an employer. After all, placing an individual with a criminal record into certain positions can lead to a wide range of negative consequences that any employer would want to avoid. So, what must you know about a Criminal Records Search? 1. If you’re NOT doing a criminal records search, you are likely to suffer the consequences. Recent estimates reveal that over 64 million people in the United States have had a state criminal history. That accounts for approximately 30% of the nation’s adult population — a significant portion of the American workforce. With those numbers, it is very likely that you have or will encounter an applicant or employee with a criminal background. The consequences can be devastating when you consider that 30% of all small business failure is directly related to employee theft, not to mention more serious workplace crimes that are caused by individuals with a prior history of criminal activity. So employee-related losses are one factor in the rationale for criminal records searches but the other involves negligent hiring. As an employer, you are responsible for the behavior of your employees on the job, and sometimes even away from the job. If your employee commits a criminal or reckless act on your watch and you have not demonstrated “reasonable care” in the hiring and retention of that employee, your risks are great. In fact, background screening is one of the best ways to protect your company against negligent hiring lawsuits, of which employers win an average of only 30%. 2. Just because you have the criminal records search information doesn’t mean you can use it. Let’s face it. With the advent of the Internet information is plentiful and you’ll find hundreds of companies that are more than willing to sell you a criminal records search. Many of these transaction shops have no problem handing over information about your applicants and employees and as far as they’re concerned, what you do with that information is up to you. This practice leaves employers open to serious consequences. To explain, there are a wide range of compliance guidelines and laws that affect the type of information an employer can and should consider in the hiring process. So what happens if you are given information that happens to be detrimental to an applicant yet cannot legally be used to make a hiring decision? How do you prove that while you had the information, you didn’t consider it in your decision to deny employment to that individual? The odds are not in your favor. The best way to avoid this situation is to establish a relationship with a background screening company that understands your compliance environment and can perform a criminal records search on your behalf, ensuring that the data you receive is useful, accurate, and most of all – compliant. 3. Just because an applicant has a prior criminal record doesn’t mean you are justified in denying employment to that individual. The criteria you use to determine whether an individual is eligible for employment based on their criminal record must consider the nature of the job. In other words, if you’re hiring for a low risk position that has a high level of supervision you may have a hard time convincing a court that denying employment to someone with a minor criminal offense on their record is justified. Alternatively, if you’re hiring a nursing home worker you will be justified in tightening up the restrictions on criminal history. Title VII of the Civil Rights Act of 1964 and EEOC guidelines are of relevance here. The Civil Rights Act prohibits employers from discriminating in employment decisions on the basis of race, color, gender, national origin or religion. Furthermore, the EEOC has determined that policies that exclude individuals from employment on the basis their arrest and conviction records may violate Title VII because such policies disproportionately exclude minorities, who are arrested and convicted at a higher rate than the population as a whole. Thus, as an employer you are clearly putting yourself at risk if you don’t follow the specific EEOC guidelines in how an employer should assess the job-relatedness of criminal records before using such records to deny employment. 4. A criminal records search is a consumer report and with that comes certain employer responsibilities. As an employer you must understand the definition of a consumer report and what it means to your employment background screening efforts. A consumer report is any report that contains information about an individual’s personal and credit characteristics, character, general reputation, and/or lifestyle. Employers often obtain consumer reports, which may include employee credit reports, driving records, criminal records searches, and investigative reports such as a supervisor interview as part of their employment screening process. A key defining quality of a consumer report is that it is obtained from a consumer reporting agency (CRA), which is a business that assembles such reports for other businesses. Proforma Screening Solutions is a CRA. Why is this so important? As an employer, when you use a consumer report in the hiring of new employees or when evaluating current employees for promotion, reassignment, or retention you must comply with the Fair Credit Reporting Act (FCRA). Sections 604, 606, and 615 of the FCRA spell out your responsibilities when using consumer reports for employment purposes. To ensure that individuals are aware that consumer reports may be used for employment purposes and agree to such use. To ensure that individuals are notified promptly if information in a consumer report may result in a negative employment decision. While the FCRA applies to criminal records searches (and other reports) provided by a consumer reporting agency, it is prudent for any employer to follow FCRA guidelines even if not legally obliged to do so. FCRA guidelines are in place to protect applicants and employees but the guidelines also serve to protect employers in the event of a negligent hiring lawsuit. The effort required is well worth it. 6. Don’t let your sensitive applicant data be sent offshore. When selecting a provider to conduct your criminal records search, it’s important to consider the data practices of that provider. Some providers choose to decrease their costs by sending the sensitive personal information of your employees and applicants offshore to be processed. The problem is, once social security numbers and financial account information reach off-shore vendors there are few legal safeguards in place to protect that information since the vendors operate outside U.S. borders. Off-shoring puts both applicants and employers at risk and should be avoided at all cost. As a member of Concerned CRAs Proforma and other members are committed to keeping the sensitive personal data we are entrusted with inside U.S. borders. 7. Understand what a nationwide background check is NOT. There is a huge amount of misinformation handed out to employers by the criminal records search industry surrounding nationwide criminal background checks. In truth, there is NO SUCH THING as an instant nationwide background search. No one database accurately or holistically represents the entire nation’s criminal records information. Sure, there are national criminal records databases but employers must understand that these databases are not 100% accurate nor do they represent all courts. That said, national records searches do have their place in the criminal records search process. They are valuable in quickly and inexpensively identifying potential criminal activity that can be followed by accurate and comprehensive local records searches. Relying on nationwide database searches as the only source of criminal records information and then using that information to make employment decisions is wrong and will likely not protect an employer from negligent hiring risks. Learn more about national criminal records searches. 8. 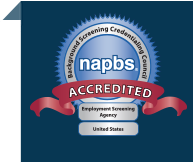 Working with a reputable background screening firm will reduce your risk. Have questions? Learn more about Proforma Screening Solutions and our criminal records search services.